The Shell logo in 1991. A long relationship with Forte has given Shell a strong presence on A-roads and at Welcome Break motorway services, which continues to this day. They were recently introduced to all Extra services, giving them strong market coverage. Larger forecourts sell LPG supplied by Autogas. In 1966 Shell had taken an interest in operating what eventually became Burton-in-Kendal and Tebay services on their own. 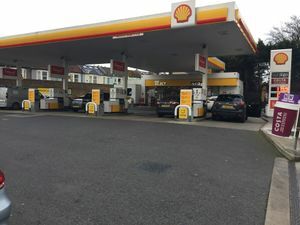 Shell themselves operate a lot of Shell sites, usually using the 'Select' (or 'Shell Select') brand for Shell's larger convenience stores at filling station forecourts (some smaller stations still use the old brand Shell Shop). They sell various brands including own-brand Jamie Oliver Deli by Shell (formerly deli2go), which has fresh products using Jamie Oliver recipes. All shops include Costa Express machines. Shell used to operate across the Republic of Ireland, but these forecourts were sold to Topaz following the controversy surrounding their involvement to and response to the Corrib gas controversy and Rossport protests.